Our IT training offering is delivered by professionals with either Microsoft Certified Trainer or Adobe Certified Instructor credential. In addition we offer trainers with the Comptia CTT qualification who can offer your company technical training for your products and services. Our training can be delivered at your offices or at one of hundreds of high quality training facilities around the UK. 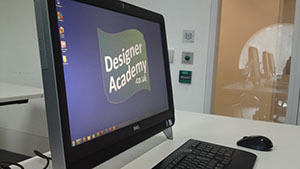 We have high quality 23″ Full HD screens with our own PC training systems so there’s no need to struggle with a small laptop screen. Dreamweaver, Flash, Illustrator, Photoshop, Muse, Premiere (Check availability), After Effects, InDesign, Acrobat. Courses run between 2-5 days depending on client needs and can be bespoke. From beginners to Intermediate. Word, Excel, Power point, Access for beginners. Courses run between 1-4 days depending on clients needs. Not all our courses are IT based, we are pleased to also offer other courses such as mentoring skills, presentation skills, staff management training and business plan writing. There is a wider selection of courses available. Please contact us for details.